Pápai Páriz Ferenc, Album amicorum p. 35. Difficile est illi, qui bene pergit opus. Michaël Sac[ri] Rom[ani] Imp[erii] Princeps Apafi MP. Viennae Austriae, die 23. Sept. A[nn]o. 1711. You can reach everything by constant labour, nothing is difficult for him who does his job well. Mihály Apafi, Prince of the Holy Roman Empire. In Vienna of Austria, on September 23, 1711. Mihály Apafi was born on October 13, 1676 in Gyulafehérvár (Alba Iulia) a son of Mihály I. Apafi (1632-1690), Prince of Transilvania, and Anna Bornemissza (?-1688). At the age of only five his father managed to have him elected Prince of Transylvania, but after the death of the former the affairs of the country were really decided by the Austrian Council of Government. In 1694 he married Countess Katalin Bethlen of Bethlen (died around 1725 in Vienna), whose prayer book contains the renowned song “Like a swift dear when hurt by the hunter” (first edition: Bujdosásnak emlékezet-köve, Lőcse, 1726). When General Caprara in 1695 marched with his army in Transylvania, Apafi was deprived of his princely title, and taken to Vienna together with his wife. Leopold I. granted him the title of imperial prince, and thus the Principality of Transylvania also formally ceased to exist after one and half centuries of existence. He received a life annuity, and died in Vienna on February 1, 1713. His diary was published by Ernő Tóth: I. Apafi Mihály és II. Apafi Mihály erdélyi fejedelmek naplója, 1634-1694. Kolozsvár: Erdélyi Múzeum, 1900. 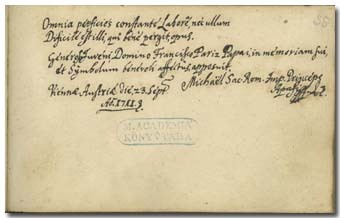 Mihály Apafi signs his note here as Prince of the Holy Roman Empire.